Spring is coming soon and the weddings are being planned. Here are some ideas for a spring wedding centerpieces and flowers in keeping with the bright and lovely coming of the season. As you choose your theme and colors, pretty pastels and seasonal flowers come to mind. Flower such as tulips, peonies, daffodils, lilies and daisies are perfect for a bright, light spring centerpiece. There are so many kinds of flower containers other than vases and here are some ideas for you. Find child size umbrellas and turn them over and fill them with flowers. Wrap flowers around the long handle and stretch out strings of clear teardrop beads from the top of the handle to the edges to look like drops of rain. Fill the cans with a pretty mixed bouquet of flowers and place them in the center of the table surround with silk flower petals. You can make a painted terra cotta pot double as a wedding favor when you fill it with all kinds of seed packets. Arrange colorful faux eggs in the nests Using your theme colors and place votive candles around the nest. Be sure they are not to close to the nest for fire safety. Small bird houses painted in your wedding colors and set on a bed of florist moss with scattered flowers or petals around is a really pretty spring look. Fill an attractive basket with colorful garden vegetables. Make sure they are fresh and not very perishable if you will be doing the centerpiece a few days ahead of time. For a informal wedding centerpiece that is really fun and looks great, fill a mason jar with the flowers of your choice. Tie a satin or lace bow in your theme colors around the top of the jar. A small pillar candle placed on each side adds a soft glow to the table.. Fill each bowl with wrapped candy you like and place on a round reflective mirror. Top it off by scattering more candies around it. Make it look bountiful. Arrange small pots of herbs and/or mint on florist moss and invite each guest to take one from the centerpiece as a wedding favor when they leave. The scent of the plants is an added bonus. You will want to tie your table decor into what you are doing for the spring wedding centerpieces. 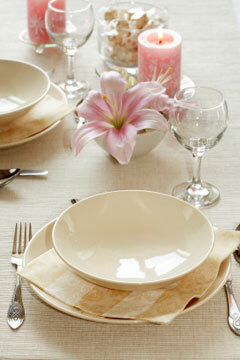 This can be done in a number of ways such as table runners in pastel shades of your theme colors. 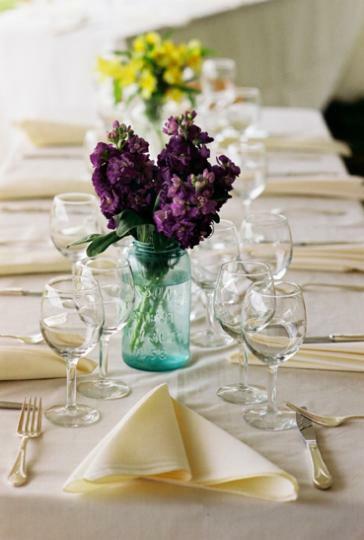 Pastel cloths with petals scattered across the cloth, and matched napkins with a single long stem flower nestled in it. 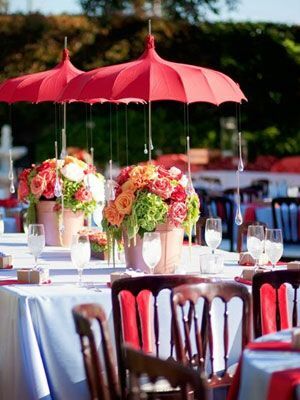 Chair covers in the theme and centerpiece colors make a very coordinated table for the guests to enjoy. You may even choose to use gingham or lace runners if they would fit your style and theme. You can follow the lead of the spring newly blooming flowers, all the lovely pastel colors and of course, your theme and your imagination to make your spring wedding centerpieces something to remember for a long time.